For this weeks “throwback Thursday” we’re talking jersey’s. A jersey is part of every team, it tells a lot about the school’s style. In my opinion, Duke has always had good style, keeping things cool and classic. 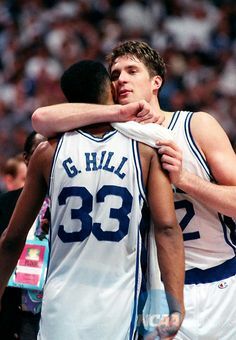 There have been many jerseys worn by the Blue Devils over the past 100 years, but today I’m narrowing it down to my top five favorites of all time. Enjoy! Starting with my number one pick, The Retro’s. As seen on the previous 2016-17 team, these are for sure my top favorite worn by The Blue Devils. With the rounded neck line (which I think makes any jersey look better), double lined around the sleeves, and the sort of “racer back” design, these jerseys really stand out. The look of them is so classic and old school, which I love (minus the short shorts). They look great in both colors (blue and white), but my favorite would have to be the blue of this collection. With the white lettering against that bright Duke blue, they just pop. A great choice to bring back last season, after wearing them once before on the 2015 national championship team. For my second pick, I chose the “earlier Duke” year’s jersey. 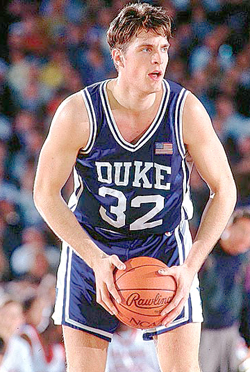 When I say earlier duke year’s, I mean the Christian Laettner years (1988-1992). This jersey is yet another classic style, this time including the short shorts. The V-neck styling and huge numbers on the front and back make this one a classic “oldie but goldie”. There is definitely a lot of history behind these jerseys, and the players who wore them have for sure made them well known. Some are even retired in the rafters at Duke for leaving their mark in the college basketball world, and will always be a part of college basketball history. Next, we have the “Seth Curry Special”. I refer to them as this because Seth was one of my favorite past Duke players, also seen on another favorite from this team, Austin Rivers. The jersey’s this team wore were pretty dope. With the design of Cameron Indoor on the back, along with all three colors incorporated into one jersey, they’re definitely eye catching. Again, my favorite one in this collection would have to be the blue one. With the black on the sides, and outlining of the letters, this jersey falls to my number three spot for its uniqueness. For my fourth spot, I chose the era of “Back in Black”, from 1995-1996 season. Jeff Capel was a starter for this team, and named captain for the first time. This was also the first time the black jersey was introduced to The Blue Devils, which would return in the future. This one is another classic, featuring the V-neck design, blue letters and side panels, with white outlines to complete the look. I truly love this jersey as a throwback option because it still carries on to today’s Duke players, only updated. Unlike the others, some say the black jerseys are cursed and shouldn’t be worn. Are the jerseys really cursed or is this just a myth? Well, according to my source dukereport.com, most fans think the black jersey is a guaranteed loss. In my opinion, I think it’s bogus. I mean, Duke did win the ACC championship last year in black jerseys. BUT, as crazy as it sounds, the scoring percentage when wearing the black jerseys compared to when they’re not worn is at least a 21 percent difference. Check out http://dukereport.com/duke-basketball/dukes-black-jerseys-really-cursed-dukeofhoops/ for the full article and some interesting facts behind this myth. Despite the “curse”, I still enjoy seeing our Duke boys in black. I hope you all enjoyed this “Throwback Thursday”! Feel free to reach out on Instagram (@presley_chandler), and twitter (@presleydavisss) to let me know what your favorite jersey is! Also keep up with The Blue Devil Dive on twitter (@BlueDevilDive) for our next jersey giveaway (coming soon)!!! PS- only 43 days until the season starts! !